The Bay Area Ridge Trail (Ridge Trail) is a planned 550-mile (890 km) multi-use trail (currently over 365 miles are complete) along the hill and mountain ridgelines ringing the San Francisco Bay Area, in Northern California. When complete, the trail will connect over 75 parks and open spaces. The trail is being designed to provide access for hikers, runners, mountain bicyclists, and equestrians. It will be accessible through trailheads near major population centers, while the trail will extend into more remote areas. The first trail section was dedicated on May 13, 1989. William Penn Mott Jr., the twelfth director of the National Park Service, is credited with sparking the idea for the Ridge Trail in a speech he gave in March 1987 at a state parks and recreation conference. While working for the East Bay Regional Park District in the 1960s, Mott's office was on a ridgeline in the East Bay, and the views from the office inspired his vision of a hill-and-ridge trail encircling the Bay and linking its communities. The plan would later attract bipartisan support, with George Miller joining Mott. In May 1987, the Greenbelt Alliance held a meeting to strategize how to approach the San Francisco Water Department and convince them to open their watershed lands to the public; Mark Evanoff convened the meeting and Brian O'Neill, Superintendent of the Golden Gate National Recreation Area, proposed a potential strategy to pursue the goals outlined in the report by the President's Commission on Americans Outdoors. Later that year, a planning committee was formed with membership from nearly 40 public agency, recreation groups, and individuals. Eventually, this committee became the Bay Area Ridge Trail Council. Dinesh Desai, a retired engineer, and Bob Cowell, a retired fire chief, completed the first hike of the Ridge Trail in 1999, despite its incomplete status. The pair followed existing trails and planned alignment where no trails existed, including a crossing of the Carquinez Strait by kayak. The first two segments of the trail, on lands in San Mateo County managed by the Midpeninsula Regional Open Space District and the San Mateo County Department of Parks, were dedicated on May 13, 1989. Other counties quickly followed suit, with Marin County and San Francisco City and County opening their first segments in September 1989; Napa, Solano, and Santa Clara counties in October 1989; Contra Costa and Alameda counties in June 1990; and Sonoma County in October 1990. Existing trails in public open spaces were incorporated into the Ridge Trail, enabling it to reach 100 miles (160 km) by 1990 and 200 miles (320 km) by 1995. By 1999, 217 miles (349 km) of the Ridge Trail had been completed, mainly on public lands. 10 miles (16 km) of the Ridge Trail were added in 2005, including a new bridge over San Geronimo Creek; at that point the Ridge Trail had completed 285 miles (459 km). The section of Ridge Trail through Crockett Hills Regional Park in Contra Costa County, which opened in June 2006, pushed the trail past the 300-mile (480 km) mark. As of 2015[update], the Ridge Trail stands at 365 miles (587 km) completed. The section of the trail that runs through San Francisco has been completed, and parts of the SF trail have been rerouted to pass through more green space and over Twin Peaks. Large sections of the trail through San Mateo, Marin, Contra Costa and Alameda counties have been completed. Much of the remaining mileage is on private property in Santa Clara, Sonoma, and Napa, and may require land acquisition and/or easements to expand the trail across these properties. Starting at the Golden Gate Bridge and proceeding clockwise, the current and planned alignment of the Ridge Trail takes it through every Bay Area county: Marin, Sonoma, Napa, Solano, Contra Costa, Alameda, Santa Clara, Santa Cruz, San Mateo, and San Francisco counties. The planned alignment of the Ridge Trail extends as far north as Calistoga and Angwin, and as far south as Gilroy. 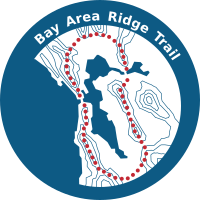 The Bay Area Ridge Trail Council (BARTC), founded in 1987, is the organization working on the Ridge Trail. BARTC initially was supported by the Greenbelt Alliance, but incorporated in 1991 as a 501(c)(3) nonprofit under co-chairs Brian O'Neill and Marcia McNally. They partner with governments, nonprofit land trusts, and volunteer organizations in all nine Bay Area counties to help protect and preserve open space and plan, construct, and promote the Ridge Trail. The Council office is located in The Presidio, San Francisco. ^ a b c d Brinkley, Suzanne; O'Neill, Brian; Van Houten, Holly (November 10, 2005). "Partnerships: Bay Area Ridge Trail". National Park Service. US Department of the Interior. Archived from the original on May 3, 2012. Retrieved December 29, 2016. ^ Rogers, Paul (May 25, 2010). "Mile by mile, landmark Bay Area Ridge Trail comes together". San Jose Mercury News. Retrieved December 27, 2016. ^ a b McHugh, Paul (June 10, 1999). "Hikers' Bay Trek Hints At Ridge Trail to Come". San Francisco Chronicle. Retrieved December 27, 2016. ^ President's Commission on Americans Outdoors (December 1986). Report and recommendations to the President of the United States (Report). Washington, D.C.: President's Commission on Americans Outdoors. Retrieved December 29, 2016. ^ a b c d e "Trail History and Timeline". Bay Area Ridge Trail. Bay Area Ridge Trail Council. 2015. Retrieved December 29, 2016. ^ King, John (June 1, 1999). "Pair Throw Kayaking Into Trail Mix". San Francisco Chronicle. Retrieved December 29, 2016. ^ a b "26 years of Ridge Trail" (PDF). Santa Clara County. 2015. Retrieved December 29, 2016. ^ Stienstra, Tom (October 27, 2005). "Bridgint the gap: A new span completes much of the Bay Trail in Marin". San Francisco Chronicle. Retrieved December 27, 2016. ^ Scott, Julia (May 28, 2010). "Bay Area Ridge Trail about two-thirds complete in San Mateo County". San Jose Mercury News. Retrieved July 24, 2017. ^ Rogers, Paul (May 25, 2010). "Santa Clara County: Lots of trail, lots of gaps". San Jose Mercury News. Retrieved December 29, 2016. ^ Pease Press (July 2016). "Bay Area Ridge Trail" (PDF). Bay Area Ridge Trail Council. Archived (PDF) from the original on December 27, 2016. Retrieved December 27, 2016. ^ McHugh, Paul (July 25, 2002). "Ridge Trail a dream coming true". San Francisco Chronicle. Retrieved December 27, 2016. Rusmore, Jean (2008). Bay Area Ridge Trail: The Official Guide for Hikers, Mountain Bikers, and Equestrians. Birmingham, Alabama: Wilderness Press. ISBN 978-0-89997-469-9. Retrieved December 27, 2016. Walker, Richard A.; Cronon, William (2008). The Country in the City: The Greening of the San Francisco Bay Area. Seattle, Washington: University of Washington Press. p. 157. ISBN 978-0-295-98815-3. Retrieved December 27, 2016. Wikimedia Commons has media related to Bay Area Ridge Trail. This page was last edited on 19 January 2019, at 19:52 (UTC).